Not green enough? Sierra Club wants more emphasis on mass transit. Image source: GA Sierra Club website. In a press release today, the Georgia Chapter of the Sierra Club urges a "no" vote on the July 31 T-SPLOST. Sierra Club argues that, as proposed, the budget is "business as usual" in its emphasis on roads at the expense of support for MARTA, pedestrians and cyclists. Even the transit expansion projects that Sierra Club supports in concept, including the Northwest corridor, are vaguely defined and underfunded. Other transit projects, like the continuation of GRTA bus service, reward the state for not coming to the table to continue commuter bus service, instead electing to rely on the region step in and assume responsibility. 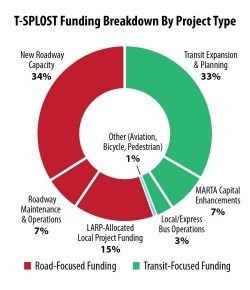 Other supporters of the regional T-SPLOST argue it will be make-or-break for MARTA, but passage would not address MARTA’s most pressing need, which is to raise service up from the skeletal current levels. Because the legislature didn’t suspend or remove the 50/50 split this year, further deterioration of MARTA service remains a real and unacceptable possibility. The current suspension expires just after regional T-SPLOST revenue would flow, so the supplemental capital funding would have limited impact on MARTA’s operational budget. . . . Read the full press release @ Sierra Club. See other posts on this topic on this website.